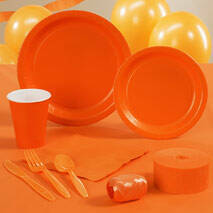 If you want to add a bright, colourful touch to your party, then our range of orange party supplies make it easy. Orange is a lovely colour for parties, reminding people of sunny days and adding cheer to any occasion, and at The Party Warehouse our plain orange, high quality party supplies mean that you can create the perfect look at your next event. Whether you're going for a zesty theme for a kids' party, or are looking for Halloween party supplies, our range of plain orange disposables means you can get everything you need from one site. From our citrus-coloured orange napkins, to plain orange cups, plates, and napkins, it's never been easier to serve refreshments to your guests. We also offer orange rectangle and round tablecovers, which can simply be removed and thrown away at the end of the party. They add a splash of colour to your party décor, and the plastic material means they can hold up to spills at a child's party. Orange is a popular colour theme for parties all year round, but especially in summer when people want a bright look, and for autumnal occasions, such as Halloween. If orange is your favourite colour, then our range of plain orange party supplies can simply be used on tables to add some colour, or you could use them for occasions such as a harvest festival party, alongside decorative pumpkins or natural centrepieces. The colour orange is versatile, and can be used in many different ways to brighten up your party or special occasion. Includes Pack of 20 Three Ply Napkins - 13" x 13"
Includes Pack of 16 Paper Plates - 9"
Includes One Rectangle Plastic Tablecover - 54" x 108"
Includes Pack of 20 Napkins.